Should schools ban mobile phones? Five experts give their opinion, and the answers may surprise you. “First, mobile phones are too easily used at the expense of face-to-face communication. Teenagers can message, avoiding a more challenging conversation. Second, smartphone apps and messages prompt dopamine release, creating addiction. Third, the mere presence of one’s phone consumes attention even when it’s not being checked. It’s been shown we have reduced working memory capacity and fluid intelligence when our phone is upside down, silent on our desk compared to when it is in another room. “Firstly, regardless of any ban, school students will continue to learn with their own phones off-campus, later in life in their tertiary education, and in their professional and workplace learning. Secondly, if school students want to investigate, collect data, receive personalised and immediate feedback, record media, create, compose, or communicate with peers, in and beyond the classroom, then using mobile apps is ideal. “We should not ban mobile phones in schools because it’s important to educate children to live well in the era in which they are growing up. A good education for students today is knowing how to use technology to learn, communicate, and work with ideas. There is significant research (including my own) that shows selective, quality and empowering uses of technology provides new learning opportunities and the ability for students to develop skills they will need for future careers. The ability to copy work off the blackboard into an exercise book is not a skill today’s employers are looking for. “Mobile phones serve many important functions. Digital literacy is a critical aspect of young people’s schooling and research shows mobile phones can play a role in supporting such learning. It’s important students learn with these devices so they can effectively participate in the workforce. The phones provide a link between students and their parents, which has an important role to play in ensuring their safety. Evidence indicates parents want this type of access. Teachers have an important role to teach students to be safe online. “Mobile phones are now ubiquitous for secondary school students. Beyond the 3Rs, an important aspect of learning for secondary school students is about safely negotiating online environments. This means all schools need to develop policies around the use of mobile phones during school hours. Given the dynamic nature of the mobile world, regularly engaging students and parents in reviewing and revising these policies is an important part of everyone’s learning. Previous Fairy tales and furry tails as students read to dogs. Next Adam Voigt’s message to students – no, you’re not special! A a teacher, I agree that “banning” mobile phones is not the answer. However, there needs to be a far greater restriction enforced on their use. How often does a student claim they can’t do research on their phone because they “don’t have any data”?? Yet they seem to be constantly using social media sites? My favourite quote for phone use is “if only they would use them for good instead of evil”. In the classroom they are a major distraction from teaching and learning. Too many schools/principals and teachers are afraid to enforce school rules as too often parents insist that their child keep their phones on them 24/7…just in case THEY need to contact them. 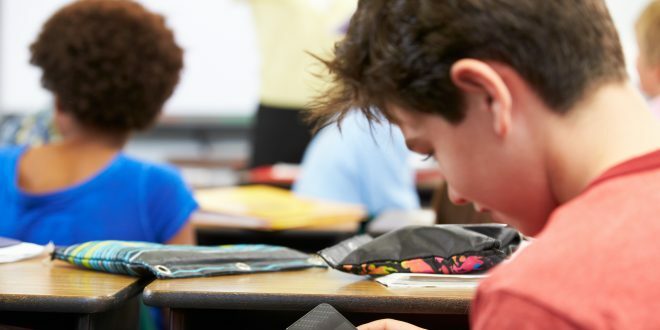 Until teachers are properly supported in their fight against misuse and abuse of these devices, they will continue to be a burden in the classroom far more often than they are a useful tool. The claimed benefits touted by ‘experts’ are minuscule in the day to day of teaching and learning. The damage to teaching and learning is large and it’s growing. The distraction is relentless, the battle with students is relentless over phones. As well as their education, they cause a lot of damaging social interaction, and a lot of anxiety. In my opinion, there is a large proportion of the cohort that really only care about the world that is going on on their phone and have no real interest in their own education. It is consuming them, and don’t pretend that it is my fault as a teacher for not ‘engaging’ them. Nothing I do engages them like their phone world does. Banning phones is the only effective way forward, as teenagers actually have insufficient self control (generally speaking, and as a group and a culture) to make any other measures effective.